Owned and bred by Lesley Joyner, Jesstacartel (left) was named the 2018 Pacific Coast Quarter Horse Racing Association Horse of the Year at the annual awards presentation on Thursday night at Los Alamitos. The PCQHRA Awards celebrate the achievements of California’s Quarter Horse breeders, owners, trainers, jockeys and champion horses of the 2018 season. Jesstacartel, a Utah-bred gelding by One Sweet Jess out of Joyner’s broodmare Stolmeacartel, received the top racing honor based on the strength of his summer and autumn derby victories. Jesstacartel won the Grade 1 Los Alamitos Super Derby by a 1 ¼ lengths over a field that included five other 2018 derby winners. He also won the Grade 2 Golden State Derby a half-length and finished only a head behind eventual 2018 AQHA World Champion Bodacious Eagle in one of the strongest ever Champion of Champions fields last year. In 2018, Jesstacartel won three of six starts, finished in the top two in all six of his outings and earned $587,763 while racing at Los Alamitos. He finished as the meet’s leading money earner among 3-year-olds and upward. Jesscartel was also named the 3-year-old gelding of the year. “We’ve had so much fun with Jesstacartel and it’s just gotten better and better,” Joyner said. Rosenthal Ranch LLC, owned by the late Bob Rosenthal and his wife, Connie, received the 2018 Frank Vessels, Sr. Memorial Award in recognition for outstanding contributions to the sport of Quarter Horse racing. Bob, who passed away on March 5, 2018 due to cancer, and Connie owned and bred Quarter Horses and Thoroughbreds for more than 30 years. Connie has continued her husband’s horse racing passion and last year the won the Restricted Grade 2 Governor’s Cup Futurity with Powerful Favorite, while also watching him excel as he qualified to the Ed Burke Million Futurity, Golden State Million Futurity and the Los Alamitos Two Million Futurity. The Rosenthal Ranch also raced 2016 Grade 1 Los Alamitos Winter Derby winner Fire At Will, 1987 Grade 1 Bay Meadows Futurity runner-up Dancedability and 1996 AQHA Claiming Stakes Challenge Final winner Bluyx plus many other top Quarter Horses over the years. The Rosenthals first became involved in racing when Bob purchased a Shirley’s Champion yearling filly named Lil Bit Blue from breeder Rod MacPherson in 1984. Lil Bit Blue gave the Rosenthals a winning moment when she broke her maiden on November 23, 1985. Ed Allred was named the owner of the year after finishing a meet-leading 56 victories during the 2018 Quarter Horse meet at Los Alamitos. Allred campaigned stakes winners He Looks Hot and Tough To Figure and Grade 1 futurity finalists Transcend and Deceiver. The owner special recognition award went to Ron Hartley after campaigning stakes winners Black Fryday and One Proud Eagle, plus stakes runners The Revenant, Capitol Grille, Myfavoritestreaker and My Favorite Check. Burns Ranch was named breeders of the year after a strong season in which the Menifee-based operation was represented by stakes winner Black Fryday and Ali Babe Foose and was the co-breeder of Powerful Favorite. “I was looking in the program and saw that Dr. Allred had won this race award in 11 years in a row,” Dr. Steve Burns said. “That’s why winning this award is such a big deal. I want to thank everyone that bought and raced a Burns Ranch bred horse. The breeder special recognition award went to Parsons Family Limited Partnership, who bred 2018 AQHA champion 3-year-old filly A Political Lady and top aged mare Thermonuclear Energy. Paul Jones was named trainer of the year after leading the meet with 63 Quarter Horse wins. Jones campaigning graded stakes winners Wave Her Down, KVN Corona and Cole Man 47 in 2018. He’s been the leading trainer 20 of the last 21 years at Los Alamitos. Chris O’Dell received the trainer special recognition award for his strong season that took him to the number two ranking in the Quarter Horse standings. O’Dell finished with 56 wins. His stakes winners included One Sweet Racy, Powerful Favorite, A Political Lady and Thermonuclear Energy. Jesus Rios Ayala was the jockey of the year after winning his second consecutive Quarter Horse riding title with 105 wins. Rios Ayala won graded stakes races aboard Zoomin For Spuds, Jess Ravin, Wicked Affair, KVN Corona and BH Lisas Boy in 2018. Eddie Garcia won the jockey special recognition award after becoming the first to ride 150 Quarter Horse stakes winners at Los Alamitos. Garcia, this track’s all-time leading rider, reached the milestone aboard Black Fryday in the Governor’s Cup Derby. He added stakes win number 151 when he guided Tarzanito to victory in the Grade 1 Go Man Go Handicap. Already an accomplished Thoroughbred jockey, Vinnie Bednar was presented with the Val Tonks Award given to an up and coming Quarter Horse rider. He finished the year ranked sixth in the Quarter Horse standings with 34 wins from 188 mounts. 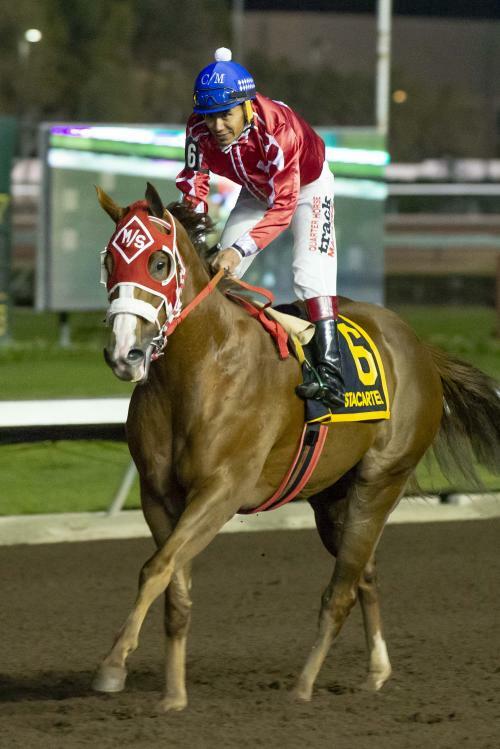 He piloted He Looks Hot to victory in the Grade 1 Robert Boniface Los Alamitos Invitational Championship. Los Alamitos outrider Keith Craigmyle was presented the PCQHRA’s Sam Thompson Award, which honors an individual who displays leadership within the Los Alamitos racing community. Craigmyle is widely recognized for his outstanding work assisting jockeys and horses on the track when the unexpected happens during morning training and night racing hours. In an attempt to catch a loose horse, Craigmyle had his leg broken when the horse swung around and kicked him as he attempted to wrangle him. “I’m here now and doing well,” Craigmyle said. Craigmyle is also a leading trainer at Los Alamitos and a winner of 544 races during his training career. Owned by Cesar Dabdoub, Ali Babe Foose was the 2-year-old colt of the year after a solid campaign in which he qualified to three major futurities and finished second in the Grade 1 Los Alamitos Two Million Futurity. The Foose colt also won the Ed Burke Memorial Juvenile Stakes. Scott Bryant’s sensational filly Flash And Roll, who went undefeated in four starts at Los Alamitos in 2018, was named the 2-year-old filly of the year. She won the Grade 1 Los Alamitos Two Million Futurity and Grade 1 Golden State Million Futurity and was the meet’s leading money winner with $1,171,654. Rosenthal Ranch’s Powerful Favorite was named the 2-year-old gelding of the year and the meet’s seventh leading money winner with $318,161. Keith Nellesen’s KVN Corona won the Grade 3 El Primero Del Ano Derby and finished second in the Los Alamitos Super Derby in route to being named the 3-year-old colt of the year. He retired following his Super Derby race with a record of nine wins from 10 career starts at Los Alamitos. Parsons Ranch’s A Political Lady was the 3-year-old filly of the year after winning five races, including the Grade 3 La Primera Del Ano Derby, La Pacifica Handicap and Vandy’s Flash Handicap. Bill Hoburg’s homebred BH Lisas Boy and Johnny Trotter’s Bodacious Eagle finished in a dead-heat in the voting for the title of aged gelding of the year. BH Lisas Boy, who won the honor in 2017, enjoyed a repeat victory after winning the Grade 1 Brad McKinzie Los Alamitos Winter Championship and the Grade 1 Bank of America Challenge Championship. The World Champion Bodacious Eagle won the Champion of Champion and his division of the Z. Wayne Griffin Directors Trials. He also ran second in the Grade 1 Robert Boniface Los Alamitos Invitational Championship. Trotter’s One Sweet Racy scored victories in the Grade 1 AQHA Distaff Challenge and Grade 3 AQHA California Distaff Challenge on the way to being named aged mare of the year. She also ran second in the Grade 1 Mildred Vessels Memorial Futurity. A1A Racing LLC’s Tarzanito was named aged stallion of the year thanks to his victory in the Grade 1 Go Man Go Handicap and third place finishes in the Grade 1 Vessels Maturity, Grade 1 Los Alamitos Invitational Championship and Restricted Grade 1 Spencer Childers California Championship. William Branch’s Rule He Will, the winner of the Truly A Pleasure Handicap and Snowbound Superstar Handicap, was named the distance horse of the year. Other equine awards included Ronnie Brooks Keller’s stakes winner Twisted Sifter as the Most Improved Horse and Hartley’s two-time derby winner Black Fryday as the Moonist Award for his season long success for a stakes or allowance horse. Dave and Sally Kidd’s KR Hi Five was named the Intermountain Horse of the Year. The Colorado-bred gelding by Five Bar Cartel won the Wild West Futurity and the John Deere Juvenile Championship. PCQHRA recognized Parsons Ranch’s Another Wise Lady with the James V.A. Carter Award for Outstanding Broodmare. The mare is the dam of multiple stakes winner A Political Lady and of futurity finalist Favorite Wise Lady. Owned by Burns Ranch, Paul Jones and Terry Thompson, Favorite Cartel was presented with the Three Bards Award as the outstanding stallion. His major stakes winners in 2018 included Tarzanito, Black Fryday and Powerful Favorite. Cesar De Alba and Elmer January both received special achievement awards. TVG received the PCQHRA Special Recognition Award for its contribution to the sport of Quarter Horse racing. Awards for the top Thoroughbred horsemen were given to owner Ashley Garcia, trainer Jesus Nunez and jockey Kellie McDaid, who became the first apprentice rider to win the riding title.